I apologize that I haven’t been posting, everything is packed and I have been very pre-occupied about this deal getting finished with the house. We received our house inspection report and at least that’s over. There are just some minor things that were picked out that need to be fixed. I think they wouldn’t be happy if they didn’t find anything wrong when they do inspections LOL!! This is the last time I will see this little pink beauty in the yard in all its glory. 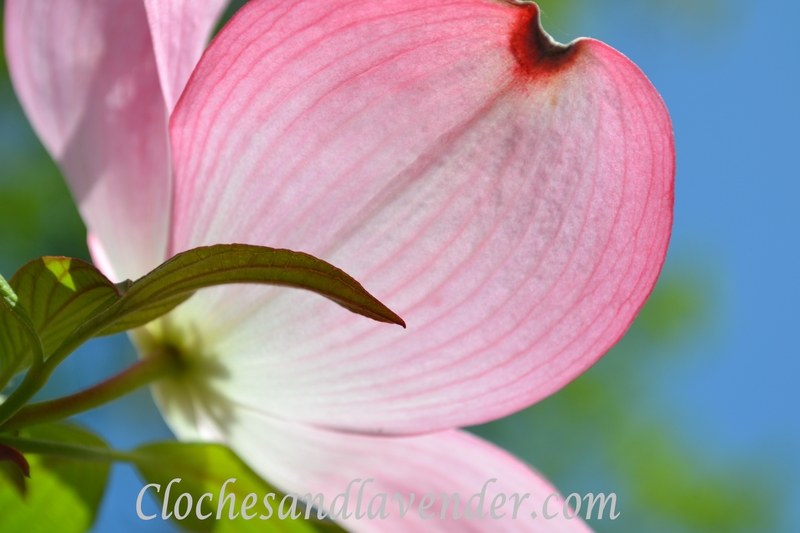 I just love the delicate flowers on Dogwood trees. I tried to get a close shot of the leaves so you can see the beautiful veining. 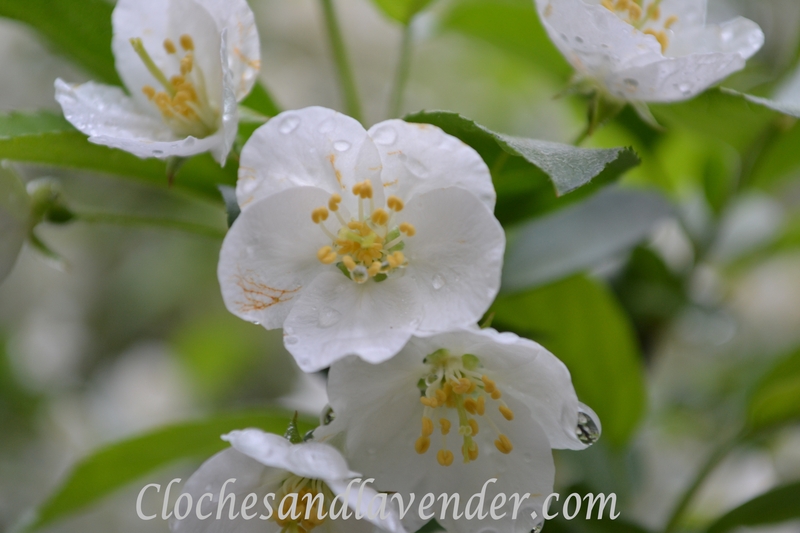 Our lovely flowering Crabapple trees are in full bloom also. The white flowers are so pretty and they are very delicate. They add such beauty to our yard. I am already planning what I will be planting in our new yard believe it or not. I must have boxwood, which I just love and a couple of flowering trees and yes, tons of daffodil bulbs. We didn’t even get the drawings from the architect yet and I am thinking about planting trees and bulbs…..LOL! We are hoping to have plans soon and get this house finished up ASAP so we can break ground on the new house. Your pictures are beautiful, Cynthia. You must be sad to leave that dogwood! It’s gorgeous. 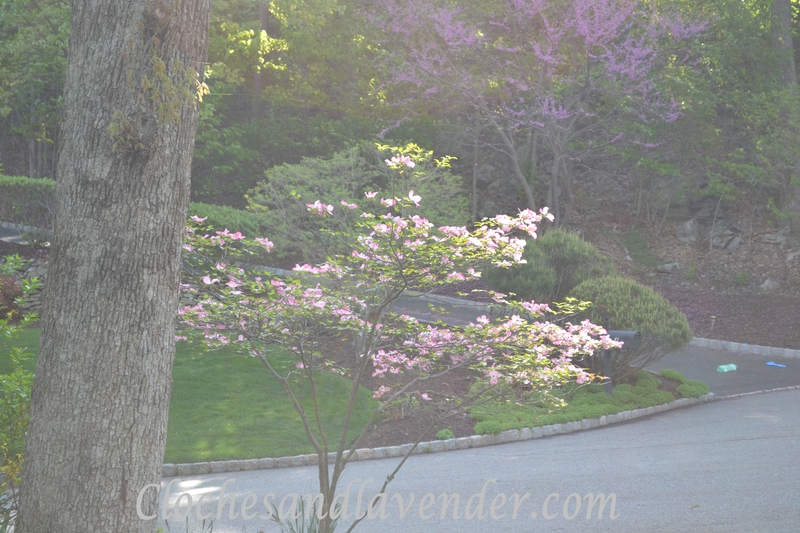 But I’m also loving the Eastern redbud in the background of the photo of your driveway – now I’m jealous!! Heather, thanks so much you are a dear friend. They are beautiful trees accross the street that we get to enjoy. Thank for always being here for me. Cynthia, you have been missed!It’s good to see you back! I know you have been busy though! Your flowering trees are lovely! I know you are ready to start building; I can’t wait to see your wonderful ideas! Thank you so much Betsy, it is good to be blogging. Beautiful images, Cynthia. The blooms of Spring are so fleeting and come and go so quickly. Wish they would last through the Summer. Can’t wait to hear more about your new house! Beautiful pictures. I know your new yard will be just as beautiful. Good to see you blogging again. Thaks for always being here!! Your blooms are just gorgeous! I would be the same way. I always think about the landscaping before the house! Manuela, thanks for stopping by and your kind words. I just can’t help about thinking, what I want to plant right now, maybe because it is planting season. 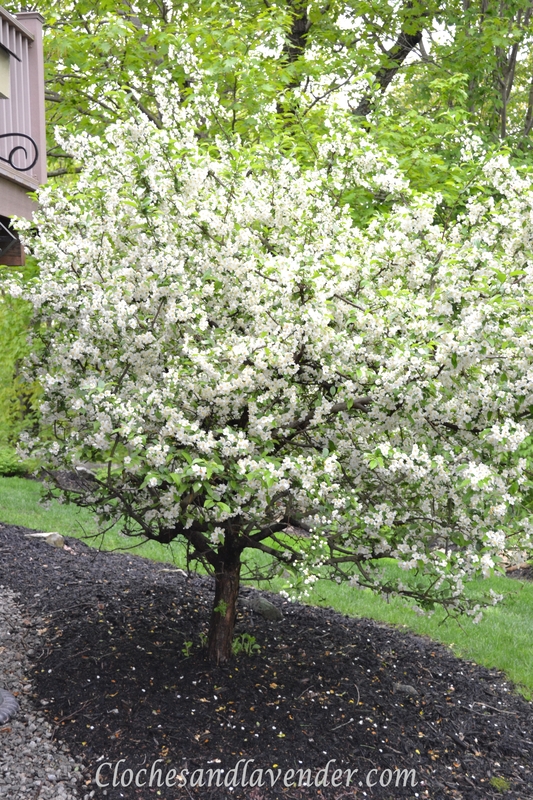 Cynthia, the flowers on your Dogwood and Crabapple are beautiful! And the way you captured them on camera is even more so. These will be wonderful shots to carry with you to the next house! And of course it makes perfect sense to be planning out what trees, shrubs, and flowers should be at the new house!! 🙂 That’s the fun of going somewhere different!! Thanks my friend for everything, you are a sweetheart! I remember you very well and I hope you follow me more often and I am following your new page now. Thanks so much for stopping by. I am glad that your process is over and I hope things move quickly from this point for us! I hope everything works out with your blog, I am sure the people that were following will follow again or hope so!! Thanks for the encouragement on the house. I’m glad to hear the inspection went well. Those things can be nerve-wracking. I hope you’re able to get the little minor things finished up and get that house in your past. Your future awaits you! I’m going to forward the link to this post to my best friend. She loves beautiful photography and nature. She’s really going to love this! The close up of that dogwood petal is so pretty!!!!! Alycia thanks for always being so encouraging and supportive. It means alot!! I want to move forward in the worst way and just get started. I hope we can move fast from this point!! You took some beautiful pictures of your trees Cynthia! 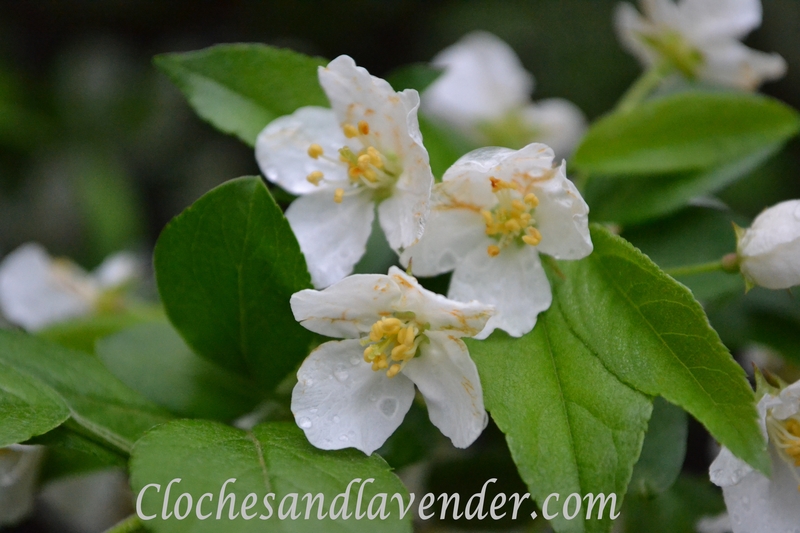 I have a white dogwood….and I believe this year (perhaps because it has been cooler) was one of the prettiest blooming years! Wishing you a lovely weekend!! Thanks girls, I love dogwoods and this is a great year for my flowering trees too. Very pretty, Cynthia. I find that I miss a lot of what I had planted at our old house. Of course, it was quite a bit to take care of, although I seem to forget that part of it. : ) Last year I planted some hydrangeas on one side of our condo that was empty of plants. It made me feel better about missing the several hydrangeas we had at our old house. This year I want to get a rose bush in. I can only fit one, but it will help with my missing all my rose bushes. Thanks so mucch, I am actually looking forward to starting fresh and having it in a smaller scale so it is not so much maintenance since it is a bit harder for me to get around. Isn’t it a shame the most beautiful trees and flowers are so short lived? I sometimes think of that as a metaphor for life. Your pictures are lovely Cynthia, and I know how you must feel leaving such beautiful surroundings. I put a lot into our landscaping (can I brag and say our yard was on the cover of a magazine?) and I miss it, but I’m looking forward to making another yard beautiful someday. Thank you for joining the hop this week! I wanted to let you know I clicked on what should have been your FB link but it took me directly to here. I must not have done the facebook one correctly. Sorry. Thanks for the visit. I am looking forward to having a new smaller garden. Great that yours was on a magazine cover! It must have been gorgeous. 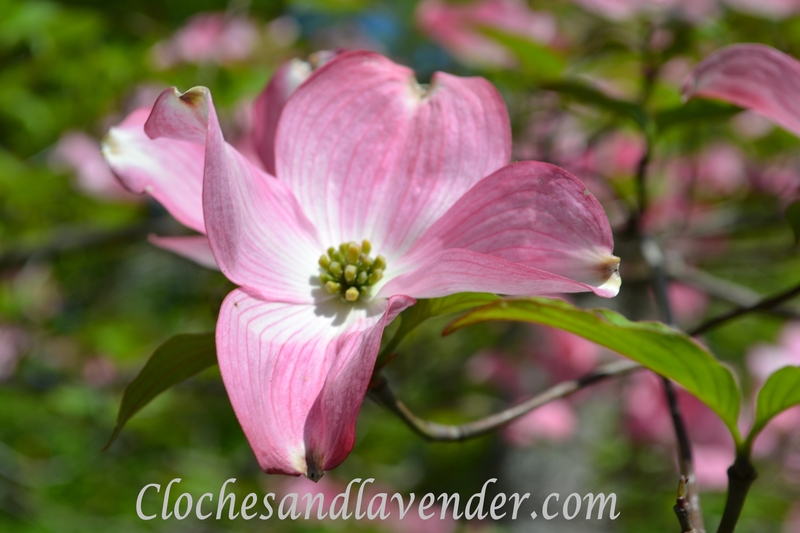 We have a white dogwood that is just starting to fade -your pink one is gorgeous! How exciting to start a whole new garden – daffodils and all! You will enjoy shopping for plants for you new home, I’m sure! Just think how many things you can plan that you want and not what someone else planted that you didn’t want. I know it will be exciting. Thanks for sharing those beautiful trees one last time. Looking forward to seeing the yard at the new house. Thanks for the visit Carlene…I will be posting as we are building our new home. Stay tuned. 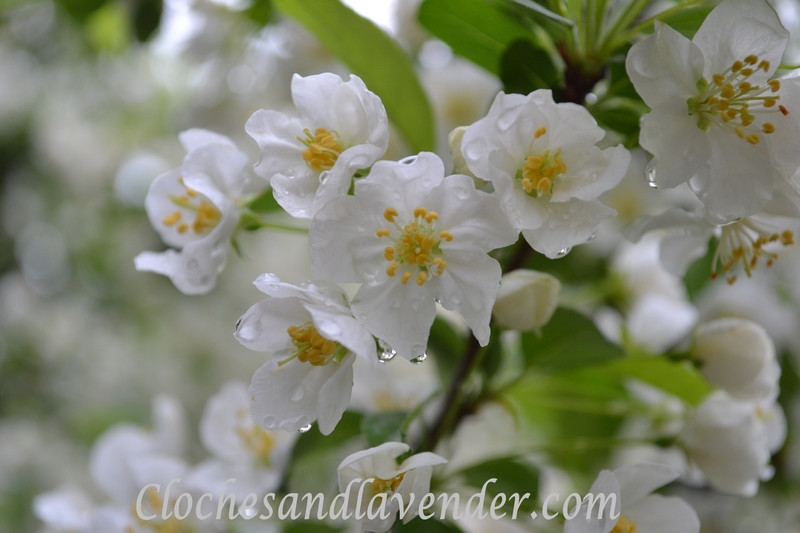 Your flowering shrubs and trees are just gorgeous! I hope you are able to get some trees planted in your new yard this year. Ours are just now getting ready to blossom and I can hardly wait! Best of luck with the inspection! We won’t be in our new home probably until winter so next spring will be really fun for us. Thanks for the visit!! Enjoy that new grandbaby. Cynthia don’t apologize!! I don’t know how you find the time to comment as much as you do!! It must be bittersweet leaving your home…but it sounds like you are already planning a beautiful yard at your new home!… I am sure you are so very excited! Very excited, I just want to get this house done with so we can start building and move on. 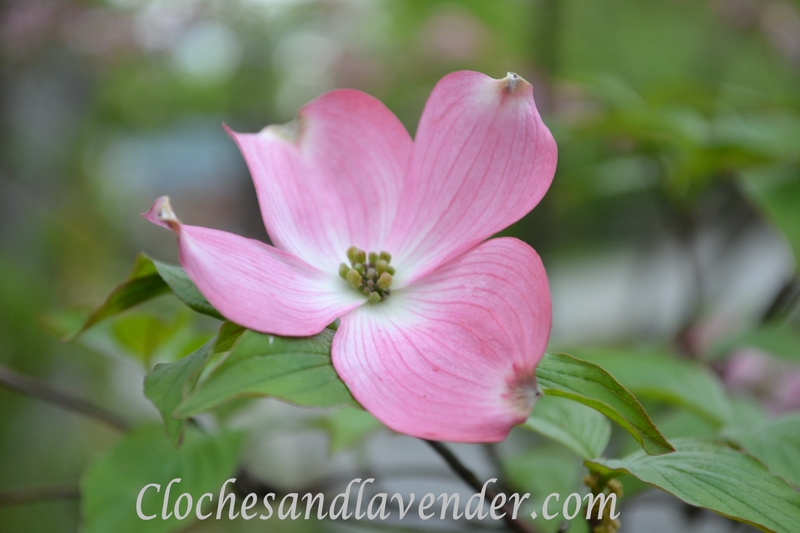 I keep hoping to have a pink flowering dogwood some day. We have LOTS of wild ones growing. Our crabapple tree has been done blooming, but it has pink flowers! I am a daffodil lover myself and have tons of them all over and want so many more. I hope you get all your garden wishes filled in your new home! I will be planting tons at our new house when it is done!! Can’t wait and I am planning on planting some more dogwoods there too. I hope you will follow along I will be posting about our journey. Your trees are beautiful! It’s good the inspection only turned up minor things. Those inspections are nerve wracking! But it’s very exciting to build a new home, good luck!! You flowering trees are gorgeous!! Dogwood is my favorite. I just love the pink ones! Beautiful flowers! I can almost smell them while looking at your photos. So pretty! Gorgeous! I’m sure you’ll have your new yard looking as beautiful in no time! Believe it or not, we haven’t even broken ground and I thinking about planting already! I love that you’re looking forward to planting your new yard. That’s the spirit! I am too! It is exciting to be able to think of starting a new garden.